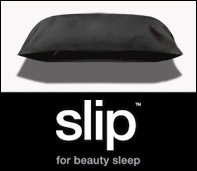 Slip Silk Pillowcase Story – In 2003, 20th Century Fox Films State Manager Fiona Stewart was prescribed acne medication which resulted in extremely sensitive skin and thinning hair. Her dermatologist suggested sleeping on a silk pillowcase. Unable to find one, she sourced the best silk she could find and wrapped it around her pillow. The results were dramatic and immediate. Her friends wanted them, then local shops wanted to stock them. Fiona and her husband both started their careers in advertising and decided to launch Slip, the world’s first silk pillowcase offered as a beauty product. Within a year of launch, Slip was in hundreds of stores across Australia and has since become a household name in Australia. Slip launched in the US in October 2015 and by Christmas, major retailers across the country including Nordstrom, Sephora, Saks, Cos Bar, Lord & Taylor and NET-A-PORTER were reordering to keep up with demand.